Set for the most part in Cyprus in the 1950s, “Small Wars” follows the Trehernes – Major Hal and his wife Clara and their two young daughters – newly arrived from Germany where Hal had previously been stationed. Hal had acquitted himself well there and been promoted to the rank of major, primarily due to his organisational skills and ability to communicate effectively with both his men and the local people; it was his great disappointment in his military career so far that he had seen no action and, with his transfer to Cyprus, Hal hoped to finally become a real soldier. But for both Clara and Hal the experience becomes an ordeal that tests both of them to their limits. Clara, feeling increasingly isolated as Hal’s duties take him away for days at a time, sees the war at first hand in spite of the family having moved into the British Army compound on the grounds of higher security but she does her best to support her husband and puts on a brave face. Hal, meanwhile, is forced to choose between his beloved army and what he knows is right when a junior officer, one not attached to his own regiment but who feels he can trust Hal, approaches him to discuss a serious incident he has witnessed. 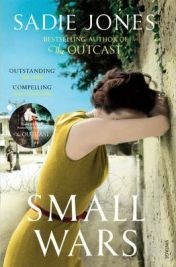 “Small Wars” is a beautifully written novel that, amazingly, outshines Sadie Jones’s excellent debut, the best selling “The Outcast”. Still there is the obvious flair for dialogue and expertise in character development but this time Jones has placed her characters against a fascinating backdrop, which she evokes with considerable skill. Her ability to match her characters with place and time is enviable and I particularly loved the supporting female characters, even if Clara is a little pale and under-developed by comparison. Jones depicts the “little England” of the military compound and the smoky bar where the officers’ wives sit drinking “white ladies” and playing cards with an intense accuracy and acutely observed dialogue to match; I can’t think of another novel set in the 1950s that evokes the period so vividly. Readers need not have an in depth knowledge of the “Emergency” period in Cyprus; Jones doesn’t present a potted explanation of the background to the situation, preferring instead to use the dialogue to fill in the gaps, a device that works rather well because it allows the story to flow naturally and explains as much as the story demands so that it doesn’t become bogged down in historical detail. Jones conveys the horrors endured in Cyprus by the servicemen and their families with grim realism, made even more difficult to stomach with the stifling heat and the goldfish bowl mentality of the compound where everyone knows your business and to show emotion is a sign of weakness. If I had to make any criticism of this remarkably fine novel, it would be that two interesting characters – Davis, the conscript who approaches Hal to report the incident, and to a lesser extent the Turkish girl who helps with the Treherne children – fade into the background in the second half of the story and much more could have been made of them. Davis in particular is a fascinating character: he’s in Cyprus only because it was learned when he enrolled for National Service that he had graduated in Ancient Greek. Davis finds army life harder than most; a confirmed academic, he doesn’t fit in with the other officers and as he is exposed more and more to the terrible events that transpired in Cyprus, he becomes more withdrawn and isolated. His story becomes rather interesting but that promise isn’t played out which is a real let down. Similarly, the Turkish nanny, a Muslim girl who speaks no English, appears initially to be about to play an important part in the story but is insufficiently developed and disappointingly fades in and out of the story. Clara seems to have a problem with the girl, something that Hal picks up on, but this interesting detail is not elaborated on. Still, these are minor flaws and “Small Wars” is a fine read. Can Sadie Jones better this? I really do look forward to finding out. No Comments on "Small Wars"